Because, I guess, it's pretty yucky. On the face of it, if you look at the big salient bits, it's a nice image: caterpillar becomes butterfly. MAGIC. NATURE. Faith. We have lots of explanations. So the living person is transformed into -- so much more beautiful! -- a soul. And the person who's being transformed -- hoorah! 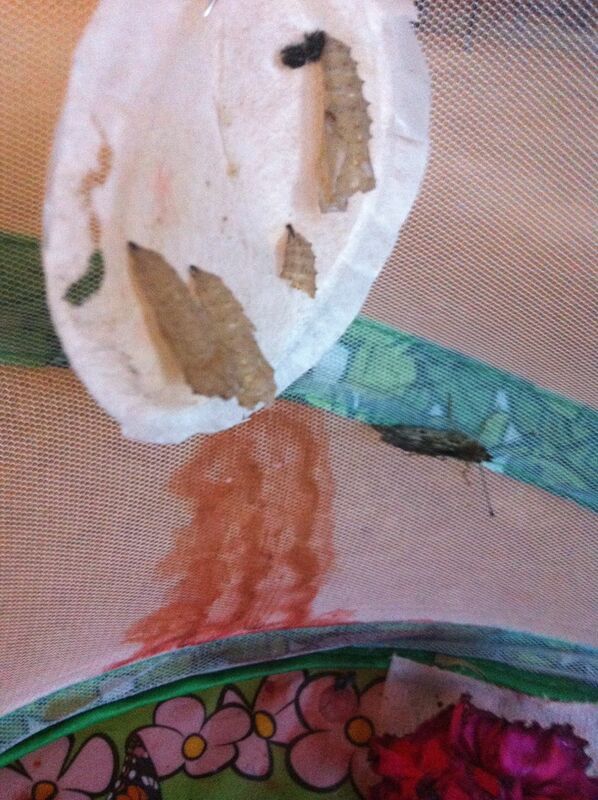 gets some rest time inside their chrysalis. We can use that. It's a good metaphor. My daughter got a butterfly kit for her birthday, though. It was upsetting enough to me that she wanted to keep the butterflies indoors as pets, and didn't care that this would shorten their lives. Kids are cute, right? They have to learn their own lessons. OK, I chose not to fight that battle. We watched most of it happen and it was some damn metaphor, really. It was also gross. I have heard that the creature inside the chrysalis is a sort of chimeric soup... neither caterpillar nor butterfly. I tried, hard, not to visualize what it was doing in there, the pretty capsule that it wove from its own excretions. None of this, of course, was covered in the friendly brochure packed with the kit. I knew my daughter was fascinated that seeing the wings emerge and dry would be something like seeing a human being born. But I had no idea the image would actually be fairly complete. Because no one told me to expect the trail of bloody, mucus-y gook that would trail from the cocoons down the mesh of the butterfly habitat, leaving a brutal stain over the adorable pink flowers on its floor. Then the little light went on. I thought, how like my life. I can't be afraid of things being messy. I shouldn't be surprised that it takes a long time to change... if I really pay attention, I know I'm pretty different than I was 20 years ago (really substantially) and that there are more than three stages of growth, that caterpillar-chrysalis-butterfly was never really MY story. And I'm not in such a murk, really. I get things done, I have a good life, life is immeasurably easier than it was during infertility, Gavin's illness, single parenting, or forming a new relationship. I guess what I'm really saying is, it would be great if the common myth was, not that you change into a butterfly (or anything magical or natural sounding like that) but that human growth is big and slow: if the common wisdom was, not that it takes a year and then you fall in love and grief goes away, but that it takes five to seven years (at minimum) to build a new life after loss. And that it takes five to seven years for a step family to begin to gel. It's slow. It has a bunch of stages, and some of them are dark and some of them are drippy. Sometimes a natural metaphor that you really like just doesn't fit. And it doesn't happen on its own.... it kind of hurts to grow. And that goop is perfectly natural, you know you will leave some things behind and you won't always be pretty. It's not a bad thing to be fascinated with it or to be pissed that the brochure didn't give you the whole story. You have to live with ambiguity, with muck and darkness. And someday, you will even fly, drink from flowers, and rest on dewy leaves, your true colors unfurled in the sunlight. At least, if a scientifically-inclined 8-year-old doesn't insist on keeping you in the guest room for all 3 weeks that remain of your life. I love this, Supa. What a beautiful way to express what we are all going through. Hugs to you Sweet Lady and to you daughter as well.